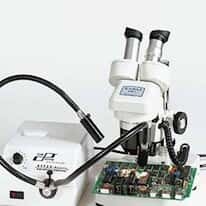 Fiber optic illuminators are ideal for microscopy and circuit board inspections. We offer these handy tools in a variety of options. When choosing a fiber optic illuminator for your application refer to the illuminator. Select from economical fiber optic illuminators delivering 10,000 footcandles to high light output models delivering up to 400,000 footcandles to models with light intensity control from 0% to 100%, and more.